It is said that, “You don’t take a good photograph, you make it” and with our family, we’re just trying to “make it” through the shoot without the photographer firing us. As any parent knows, taking photos with children is a total crap shoot….either you have the well-rested, unicorn children that magically play and pose as directed OR you have my children...the fighting, nose-picking, running- all-over-the-place children that I'm always apologizing for. We definitely fall into the "photo hooligan" category yet we always manage to get great photos with all seven children….and here’s how I do it…. 1. Let your kids be kids! You want to capture the souls of your children in photos, not just their smiles. A photographer once told me that children who are constantly repositioned, told to sit still or smile a certain way have the hardest time with photos. Let the photographer capture your child’s personality naturally and with their artistry. 2. Create a visually interesting and appealing color scheme. If you’re still wearing the white or black shirt with jeans or khakis look, you need to step up your photo wardrobe game. I always choose our theme around our younger daughters’ outfits and try to go big with color or design for them. Then I select two of the more muted colors in their outfits for the rest of the family and add accessories. I love rain boots, knee high socks, hair bows and necklaces for girls’ accessories. If you have boys, go with a plaid or patterned shirt and work from there. Newsboy caps, suspenders, bow ties or a prop are all great accessories for boys. 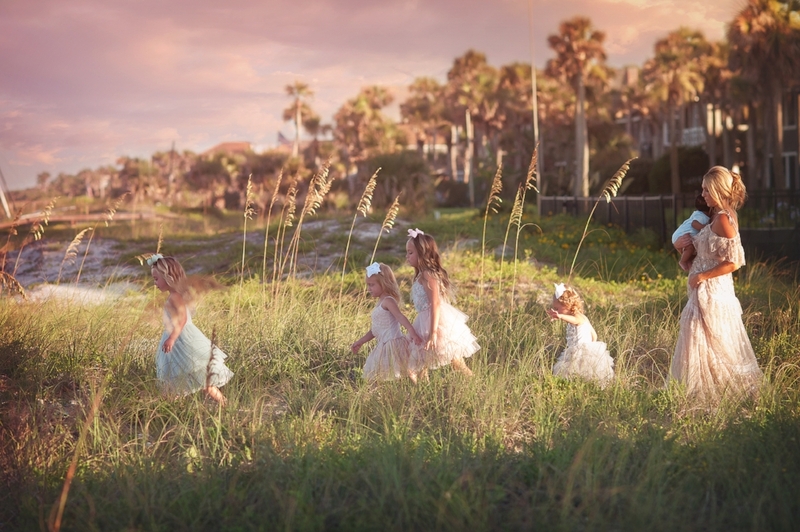 If you’re looking for whimsy and fantasy for your daughters, Tutu Dumonde, is a dress line like nothing you have ever seen before. This line celebrates the spirit and beauty of little girls in dresses they WANT to wear. With elegant tutus, unicorn sparkled dresses, “swan queen” feathered frocks, crystal and beaded capes and coordinating head bands, Tutu Dumonde makes it hard to take a bad photo. I have two children’s boutiques that I buy from regularly that carry these dresses and both have great sales and often work with buyers on multiple dresses. If the average $150 price tag is too much for your budget, I discovered a wonderful online store called Rainey’s Closet where you can RENT Tutu Dumonde dresses and accessories for 5-10 days for only $30-50!!! This is a GENIUS idea for photoshoots, holidays, weddings, special occasions and a mother-daughter weekend! I love that this company is run by two mothers and was designed specifically around the concept of styling little girls for family photos. My blog followers get 15% off with the code NEW15. 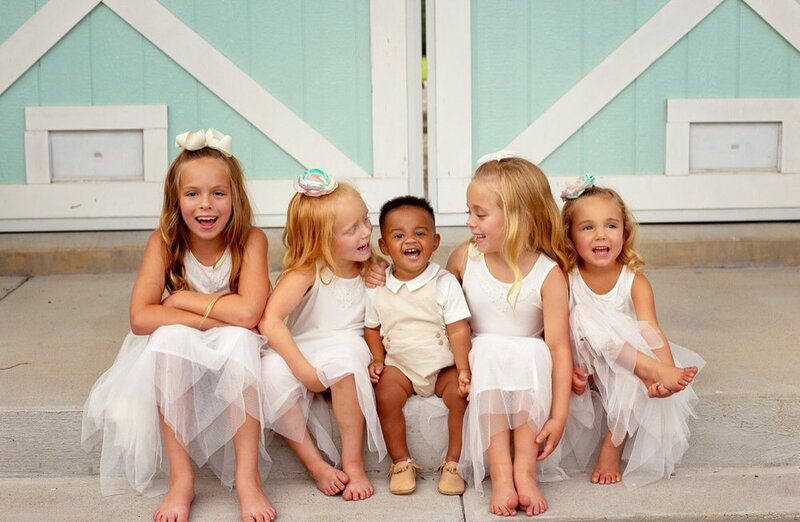 Beyond Princess Boutique is an online girls' boutique that has AMAZING dresses for girls and great sales on Tutu Dumonde. They also carry dresses that can be used in weddings and for special events. Enter code "mommymayhem" at checkout for 15% off your order. 3. Use nature’s best lighting and schedule your photo shoot before sunset. This is the best time of day for photos so I always try to make sure that my kids have an early dinner then get dressed for pictures. Steer clear of mid-day shoots (unless it’s overcast) with harsh overhead lighting and funky shadows. If a photographer wants to shoot your family at noon, politely decline. Sunrise is also great but that requires a lot of work before the sun comes up so with a lot of children, that could be quite a goat show at 6:00 am. 4. Find a photographer that has kids or comes from a family with a lot of kids. I love when I have photographers that are parents because I know they understand the madness. Before one of our favorite photographers, Emily Rose Photography, became a mother, I knew her as one of nine children. Who better than to work an hour with several children than a woman who lived that chaos every day of her life? Another great photographer I use in Jacksonville, Jaiden Photography, is a mother of three who reassures me that my children's misbehavior doesn't bother her. This makes us all relax which lends itself to better photos. As a side note, one of my close friends, Chad Martel, is a high profile, concert tour photographer who doesn’t fit into either of these categories. He's used to touring with Guns n Roses and Korn so I supposed toddler behavior and rockstar behavior isn't much different. Always ask your photographer what their experience with children is. 5. Take the photos of the tears, the fighting, the running and the nose-picking. While those ones may not make the annual holiday card, they will definitely make for some laughs in years to come! Some of my favorite pictures are the inappropriate outtakes from photo shoots because those are the ones that tell the best stories!